I like to use 1 pound of hamburger and 1 pound of sausage. I like the extra flavor the sausage provides. Instead of chopping a fresh onion, I purchase frozen onion already chopped. As for the chili powder, it is according to taste. I only use 1 tablespoon. I have made it with more, but though I like some spice I can’t tolerate really hot food and I found 2 or 3 tablespoons to be too much for me. My husband would love it, but he’s happy to heat his up more by adding some hot peppers! 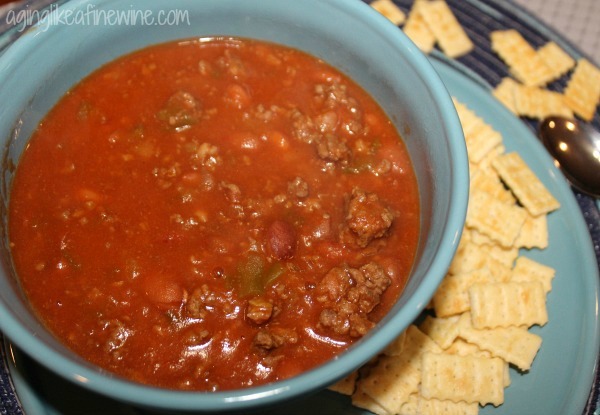 Zesty tomato soup is the perfect soup to use, but in all of my years of making this chili I have only been able to find the zesty version one time. So I settle for regular tomato soup. If you’re a kidney bean fan feel free to use those instead of the chili beans. 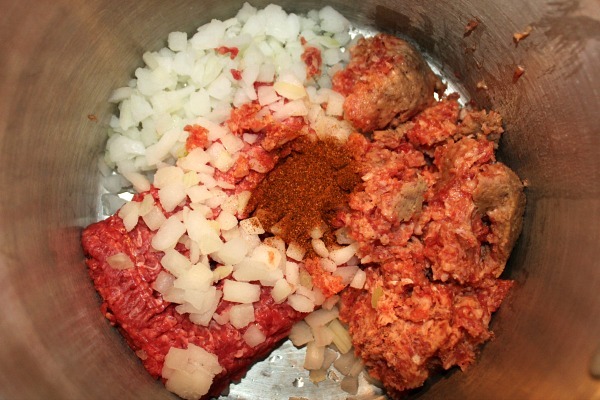 Brown the hamburger with the onion and chili powder, drain. 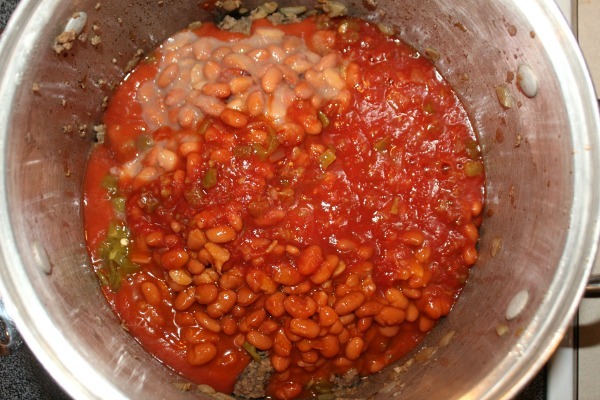 Add all of the other ingredients, including the liquid in the cans of chili and pinto beans and mix together. Simmer for at least 1 hour, stirring often. That’s it! 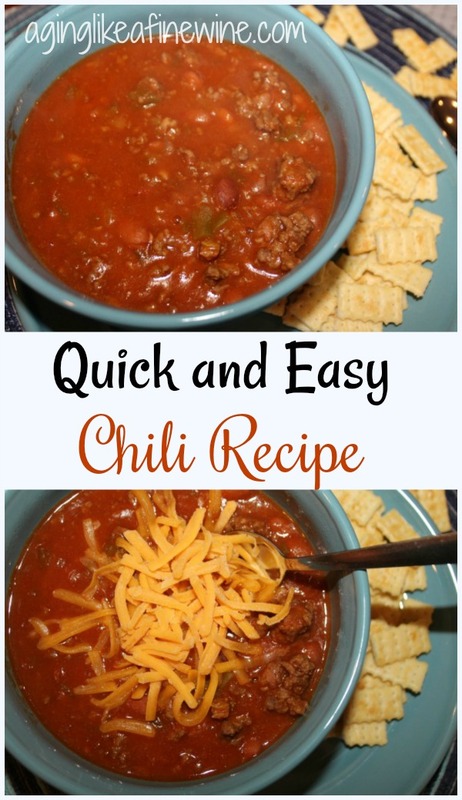 A chili recipe can’t get much easier than that! The most important thing is that my husband and I really like it. And now I hope that you will too! As for the chili powder, it is according to taste. I only use 1 tablespoon. I have made it with more, but though I like some spice I can't tolerate really hot food and I found 2 or 3 tablespoons to be too much for me. My husband would love it, but he's happy to heat his up more by adding some hot peppers! If you're a kidney bean fan feel free to use those instead of the chili beans. Brown the hamburger with the onion and chili powder. A recipe found in Quick and Easy Cooking, a 1992 cookbook presented by Home Economics Teachers. The contributor was LaRae Harguess from Hesperia High School. This post will be shared at link parties found on my “Where I Party” page. I have never seen a chili recipe using tomato soup, very interesting I will need to try your recipe. I’ve made lasagna adding salsa but never chili! What a great idea! And I’ve never thought of adding it to lasagna; interesting! Thanks for stopping by! Thanks Marci! Frozen chopped onions are one of my best friends! When a recipe says quick and easy, I’m onboard! It looks and sounds yummy! I shared your post on Fb, Pin, and Tw. Me too, chopping and chopping is not my thing. Thank you for sharing! My husband and I do to and this recipe is my favorite. Thanks for reading and sharing! Thank you very much, Marilyn, for featuring my chili this week! I appreciate it and will definitely stop by this evening.